Creggan Landlords: Thomas Prideaux BALL; Alexander HAMILTON; Walter McGeough BOND; Ann CLEWLOW; Mrs. QUINN. NOTE: See also: 1833 February 5th news clipping. This news item intrigues me since it is a side of the landlord-tenant relationship that often gets less attention - understandably, given history and context - than the kinds of landlord actions that resulted in violence. NOTE: Thanks to Pat Connors Tithes Page, I can add that in The Tithe Applotments of 1828, Thomas P. BALL held title to Corliss, Monag & Urker. A Widow QUINN held land at Cullyhanna and Sytrim, and a number of other QUINNs owned land also in these townlands and nearby. NOTE: Thanks to Peter McWilliam, I have learned that the ongoing Tithes War was part of the context for these actions. TITHES -- we understand that THOMAS P. BALL Esq., has undertaken to pay the Tithes of his large estate in the parish of Creggan, Diocese of Armagh to the Incumbent, and that he makes a present of it to all his tenantry, whether they hold their land under him by lease or otherwise. We are also informed that ALEX. 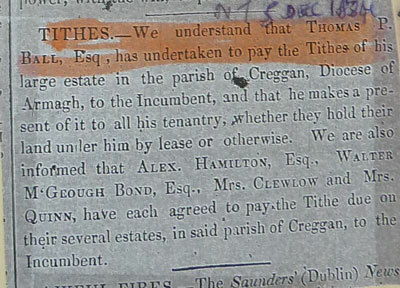 HAMILTON, Esq., WALTER MCGEOUGH BOND, Esq., Mrs. CLEWLOW and MRS. QUINN, have each agreed to pay the Tithes due on their several Estates, in said parish of Creggan, to the Incumbent. Thomas Prideaux BALL (1796-1869) son of Thomas BALL & Mary PRIDEAUX. The BALL family held leases in Creggan going back to at least Cromwellian times. At the time of Griffiths Valuation, he had substantial holdings in the townland of Corlis. Alexander HAMILTON. I suspect that this is the Alexander HAMILTON Esq. Barrister at Law and eldest son of Hugh HAMILTON, Bishop of Ossory and Isabella WOOD. He was born 1774 in Newtown, Co. Armagh and died 1840. He married Juliana TISDALL. He was the older brother of Hans HAMILTON. Mrs QUINN. I know next to nothing about the QUINN family. There seem to have been both Presbyterian and Catholic QUINNs in the region. Thomas POWELL, an under agent of William QUINN who had inherited his uncle’s estates in South Armagh, was murdered near Newtownhamilton on January 2, 1841. SEE: Agrarian Disturbances around Crossmaglen, 1835-1855: Part III Kevin McMahon and Thomas McKeown, Seanchas Ardmhacha: Journal of the Armagh Diocesan Historical Society, Vol. 10, No.2 (1982), pp. 380-416. Is it possible that the deceased uncle was the late husband of Mrs. Quinn? If so, then it would appear that the nephew had initiated an abrupt 180 degree shift in how the tenancies were managed. · A John QUINN was murdered near Dundalk Sept 22, 1835. NOTE: I do not know if this was the John QUINN of Dowdallshill. · A Presbyterian, Felix QUINN, of Ballyalbany was a member of the Volunteers (associated with the Uprising of 1798). · I find it interesting that a David Quinn JACKSON son of a John JACKSON and a Mary QUINN was born near Dundalk Sept 7, 1870. A QUINN burial in Creggan graveyard is that of Fr. Terence QUINN, P.P (b 1715). They are a family with deep roots in the parish.